Figuring It Out 101: Are You Getting the Best Sleep That You Can Get? This post contains affiliate links which might mean that I could make a little extra profit at no cost to you. 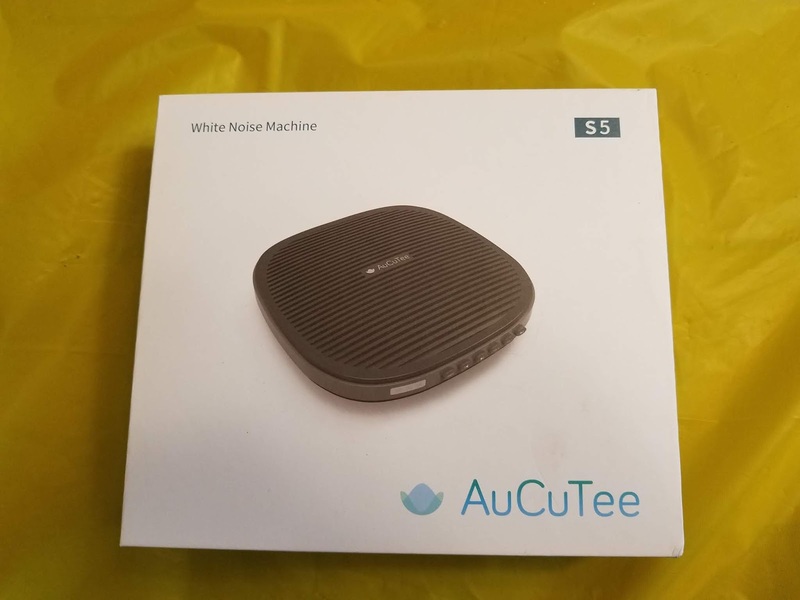 I was asked to try out AuCuTee's White Noise Machine for an honest review. All opinions are my own. 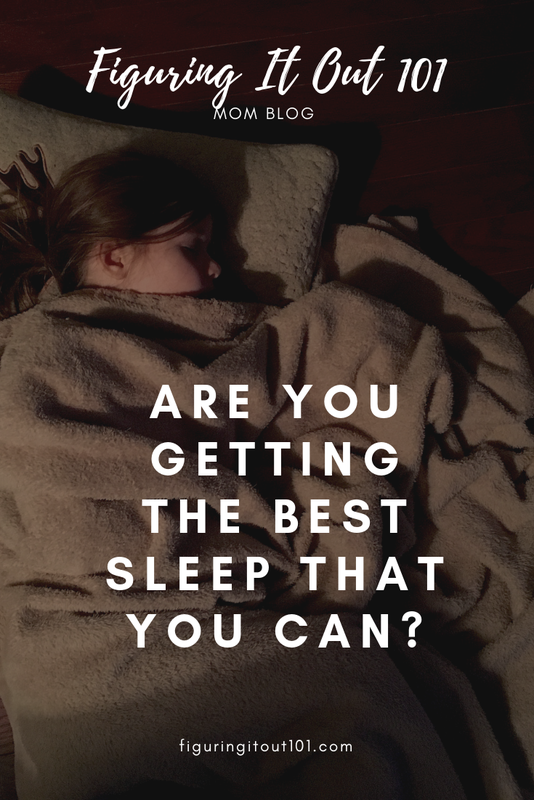 As a mom, I know how important sleep can be to myself, my kids, and my husband. When someone is acting out, it's usually one of three things: they're hangry (hungry/angry), they aren't feeling well, or they need a nap. My biggest culprit is lack of sleep. There are some people who can operate on six hours of sleep or less. I am not one of those people. 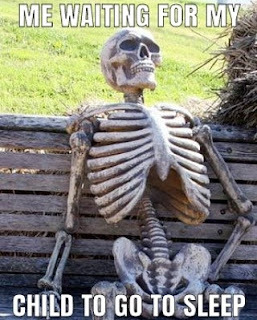 I've always gone to bed by 9:30, most nights, but as an adult with children, I've stayed up later just to have some down time that doesn't include my children, which means I have to wait until my kids are asleep. So, after I've finally gotten my kids to bed, it seems that I'm the most alert I've been all day, even though I was tired and falling asleep on the couch with my family about an hour before then. Since I want a little bit of time to do something that I enjoy, I'll either stay up a bit and watch some tv, scroll through my phone, or lay down and read a book. By the time I decide that I should go to sleep, my mind still keeps going and doesn't turn off. The next thing I know, it's 11:30 and I have to be up by 7:00 to get the kids up and ready for school. Anxiety starts to set in or I get an idea for something to write or realize that I forgot that I had something that I needed to do and I didn't and then it's 12:00, then 12:30. Who knows what time I actually went to sleep. So when I was asked to review AuCuTee's white noise machine for an honest review, I thought, "Why not? ", maybe it will help. I was so excited and surprised when I received it. The size of it was smaller than I thought it would be so I thought that it wouldn't be very sturdy and that it would be busted within the week, but it has held up greatly despite my children's efforts of using it as a football or for dance parties. The packaging was very cute. It was small and simple and it conveyed what it was, nicely. On the side of the box, it depicts it's function and use in easy-to-see and read terms. 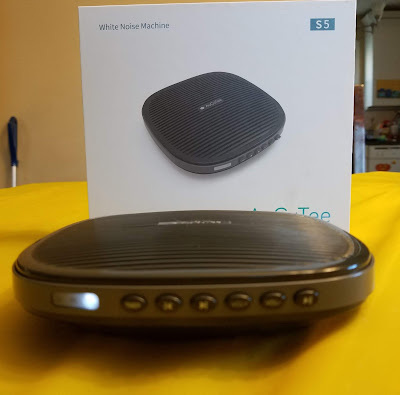 I thought that it would have been nice for it to show what the sounds were on the box and it doesn't, but it does show them online. 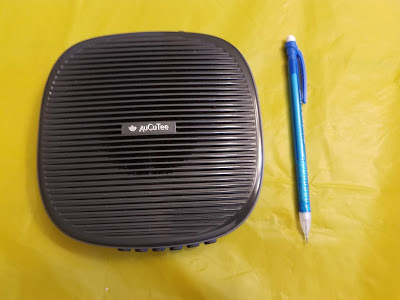 Just to see how small AuCuTee's white noise machine is, I scaled it next to a pencil. It's the same length as a mechanical pencil and just a little thicker than one. It's compact and sleek design makes it appeasing to look at and small enough that it doesn't get in the way. AuCuTee's white noise machine features a timer that can set for 30, 60, or 90 minutes. It has a soft light that shows you which one you've chosen, but it's not so bright that it keeps you awake. If you wish for the machine to run all night, it can do that too. It can be battery powered (included) or you can plug it in. I've found that once it's been charged, you don't need to plug it in for two to three days which is nice because then you have a free outlet to charge your phone. It also has a spot to put in head phones, but I haven't used it because my husband didn't care if it was on. 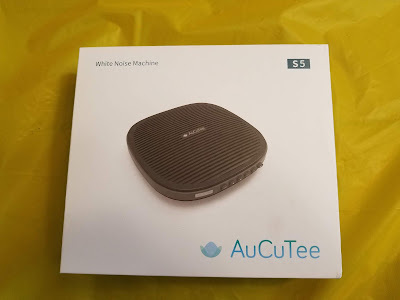 What I really liked about AuCuTee's white noise machine is that it offers 20 soothing sounds: lullaby 3, white noise, pink noise, gray noise, brown noise, fan, crackling fire, clock ticking, train, crickets, frogs, birds, rain, thunderstorm, stream, ocean, shush, womb, lullaby 1, and lullaby 2. The first night I used it, I tried the white noise, but quickly turned it to the thunderstorm sound. I had it at a medium volume and to my surprise ( I was skeptical at first) I began to feel tired. My mind, which is always racing with thoughts, would get interrupted every time the thunder sounded and I quickly lost my train of thought. I had the timer feature on for 60 minutes and fell asleep before then. The next night, I listened to lullaby 2, and the same thing happened. The following night, I listened to thunderstorm again, but didn't put the timer on. That was the best night I had slept for a while. When I woke up the next morning, the thunderstorm was still playing, so I snuggled into my blankets and kept trying to sleep. I had actually thought it was really raining, so when I came to, I was very confused because the sun was bright and shining. Anyone who has kids, knows how long it takes to put your kids to bed. They are always getting up to get something to drink, or they suddenly have to go to the bathroom, or they tell you they need another goodnight hug and kiss even though you've already tucked them in, helped them say their prayers, and hugged and kissed them fifty times, that night. My boys both share a room together so when it's time for bed, our four year old wants to stay up and play and since my oldest has ADHD and is still only eight years old, bed time has been the biggest struggle. Almost every single night, my youngest falls asleep downstairs either on the couch or sitting with me because we know that my oldest won't go to sleep if his brother is in there so we don't let him go to bed in his own bed. I was very curious. My kids kept asking me if they can try the machine, so I let them try it. The first night, I let my oldest wear my Fitbit to track his sleep. He has a busy mind like I do, so even though we put him to bed at 7:30, sometimes he doesn't actually fall asleep until 10:30. 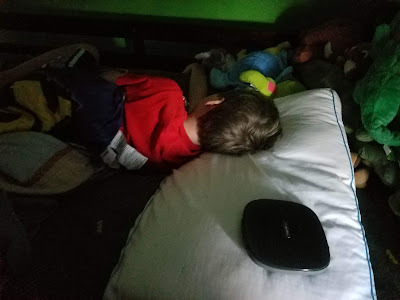 The night that he tried AuCuTee's white noise machine, he fell asleep only 30 minutes in. As if this all wasn't new, we tried something even more different than we normally do and we let my youngest go to bed at the same time with my oldest. My youngest likes to sleep with the lights off, while my oldest likes them on. I was able to convince my oldest to let us turn the lights off IF we tried the crackling fire sound. They have glow in the dark stars on their ceiling so I convinced him it would be like camping. He agreed and we turned the lights off. 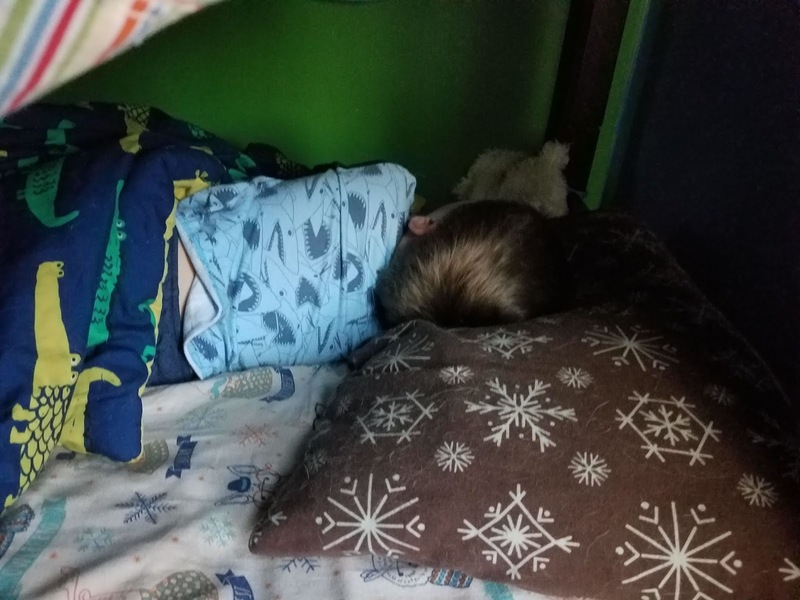 My youngest, who is always trying to play and climb up to my oldest's bed (bunk beds), laid down quietly to look at the stars and listen to the crackling fire. That was the easiest time I have ever had putting my kids to sleep. Both boys fell asleep right away and to top it off, my youngest didn't wake up once that night. 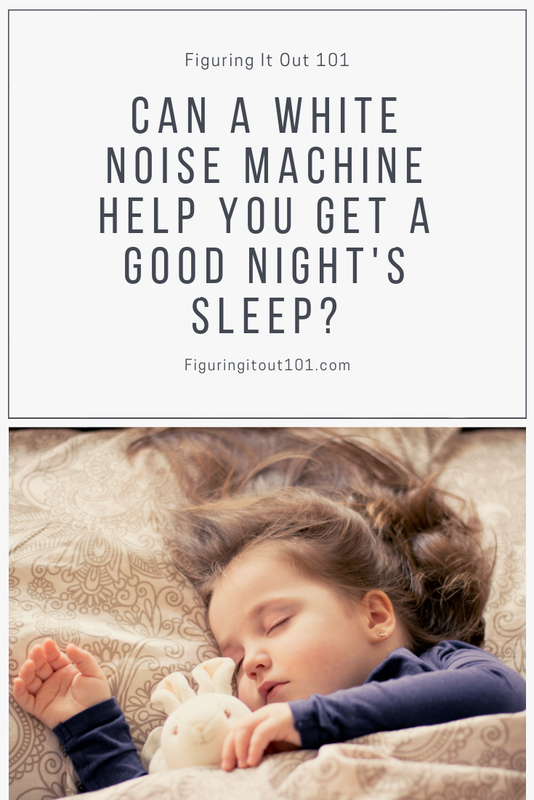 So you better bet that this machine has made a huge difference and has made its home in the boys room to get them to sleep. his pillow the resting place for AuCuTee's white noise machine. "Well what about your daughter?" you ask. Well, she wanted her own white noise machine, too. She sleeps in her own room so she wasn't able to listen to our only noise machine if it was in the boy's. After having such success getting the boys to sleep, I was very hesitant to take it away from them. So I asked her if she would be ok listening to something on my phone. She agreed. For that night, I downloaded a free white noise app. To her dismay, it didn't have any lullabies that she liked, and decided to listen to birds chirp. It was a temporary fix, but it didn't have any sounds that she was in love with and the phone volume kept readjusting itself and it also kept getting interrupted by all of my phone notifications. 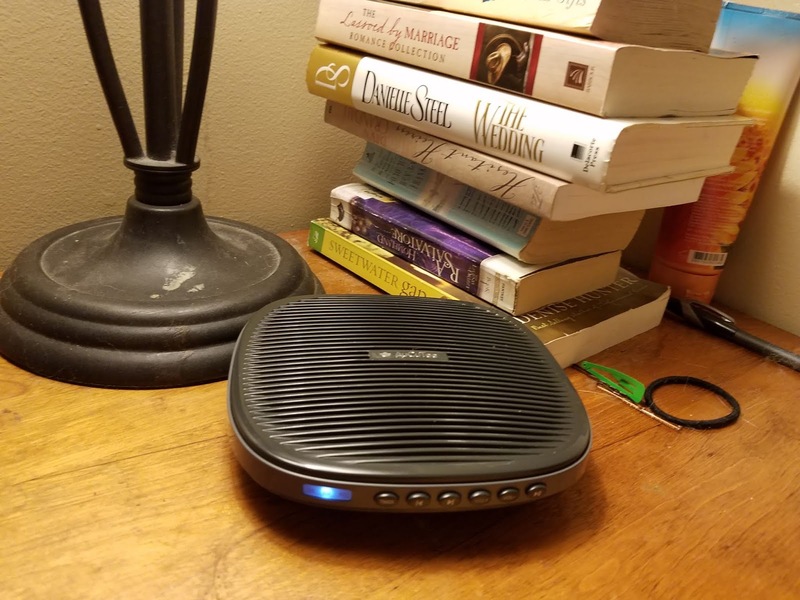 After speaking with my husband, we agreed to buy her her own white noise machine. She was SOOOOO excited! I was too, because after she fell asleep and I reclaimed my phone, I couldn't turn the birds off of my phone without deleting the app and it was a HUGE battery drainer. So, would I recommend the AuCuTee sound machine? Yes, I would. Because of it's size and design, it's not imposing. I really like to read so my night stand is usually covered in books. 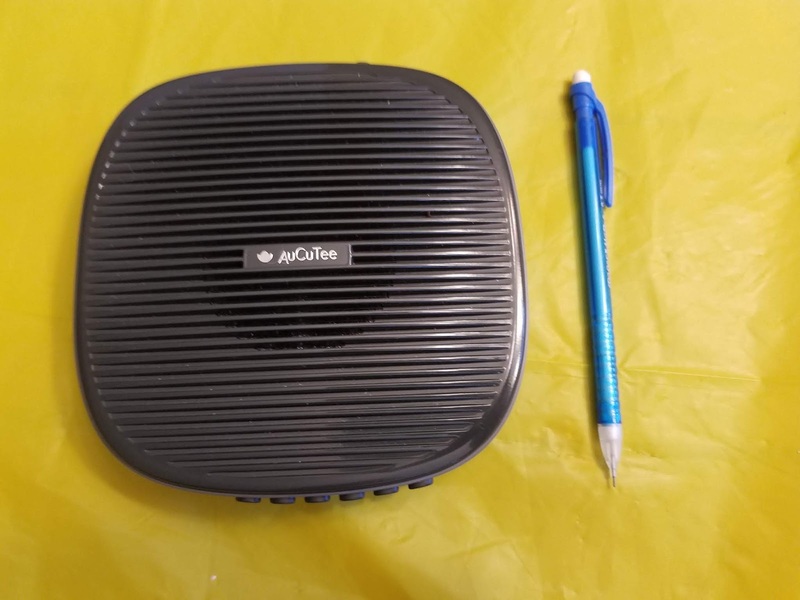 AuCuTee's white noise machine is smaller than most of my books and it's lightweight makes it easy to stack and not take up too much space. The noises aren't annoying and it's volume can be adjusted. While my kids like to have it turned up loud, I like to keep it at a quieter background noise. My kids have slept better with it and so have I. Looks like this was a real life saver in getting your kids to sleep. I bet the phone was drained pretty fast with the app. And you didn't have it for a while. Bummer. Hope it continues to work. I have a while noise machine and I love it! I'm so glad you love yours! I was very skeptical, but it has helped out my kids night time routine immensely. Often people use the tv to have the same effect. It's a nice machine, I would love to try. I have friends who always left their tv on. When I was young and would stay the night there, It would drive me crazy! She would have the tv turned on to MTV and I would wake up all the time to the same old songs. There are some songs that I absolutely hate because of it. I face issues with sleep at times, sometimes I am unable to sleep all night, I guess this would work for me too. Thanks for sharing. This is a very cool gadget. It would be worth a try, but if it doesn't work, see a doctor if you haven't already. Dear god, I cannot tell you the last time I got decent sleep! Perhaps, I should look into one of these white noise machines! Part of my problem is that I hear EVERYTHING! Any noise that's different from what I've been hearing wakes me up. I'm just glad that my kids will go to bed because of it. They pretty much took it over. My ex really did love those white noise machines. It never really seemed to help me at all. Although my ex who would wake up to a pin dropping, white noise seemed to help her out a lot. I couldn't listen to the actual white noise or static sounds because they got on my nerves. My favorite was the storm one because it seemed the most natural. I wish I would have had one of these so much sooner. 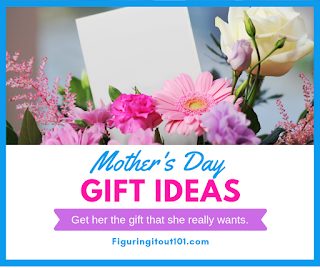 My youngest would always wake up in the middle of the night and to avoid waking everyone up, we went and slept on our couch many nights. That’s awesome that it works so well! I used one once and it was really great. I slept right on through to my alarm. I typically wake up several times a night for whatever reason and I never did! Me too. I wake up to everything. I listen to a thunderstorm soundtrack while I work to help me focus and relax. I used to have sleepy time app on my kindle too. I love crackling fire, water stream, distant thunder. Beach waves drive me crazy! I listen to music while I work....I hate the crickets and the stupid birds.